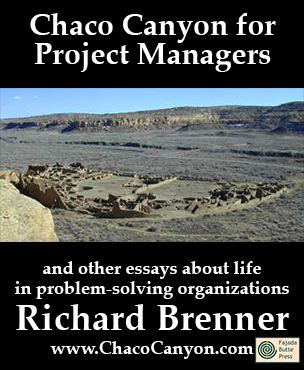 Chaco Canyon for Project managers is a collection of essays for people in dynamic problem-solving organizations. If you work This item is available in downloadable format only. Since it isn't shipped, be sure before you order that your shipping charges are 0.in an organization that executes much of its work as projects, your life probably feels like a slow-moving emergency — at least some of the time. When we've been through a long stretch of such chaos, we sometimes feel responsible for it. That is, we feel that we've done something wrong, or failed to anticipate something obvious, or that we lack certain skills or capabilities. Usually, the facts simply do not support these feelings. This ebook gives you a different perspective. The essays in this ebook are based on observations I've made of client organizations and others over a span of 15 years. They're intended to get you thinking about how your organization deals with the problems of project management in a dynamic, fast-changing world. The book is packed with People who ordered this item also ordered Geese Don't Land on Twigs (and other observations about life at work) and 52 Tips for Leaders of Project-Oriented Organizations.insights, new perspectives, and tools for solving the problems that managers and project managers face every day. Because every person and every organization is unique, you'll probably want to tailor the approaches suggested in Chaco Canyon for Project Managers but they'll get you thinking about a solution that will work for you. Write to me about how it turns out at the email address below. Chaco Canyon for Project Managers is in Acrobat format, which gives you several advantages. You can print it, and read it like any book. Or in electronic form, you can use the search capability of Adobe Reader to find passages of special interest to you. If you load it onto your laptop, tablet, or other mobile device, you can read it anywhere — and it's weightless, too. 163 pages.